Naturally, with the release of GLORY DAYS on DVD (orderable from CDJapan & YesAsia), Tak & Koshi have posted new messages for the faithful. We had the happiest 20th anniversary thanks to all of you! I really appreciate you all! Please take a look at the men who continue to run, even now!! The 20th anniversary live was rainy, again!! 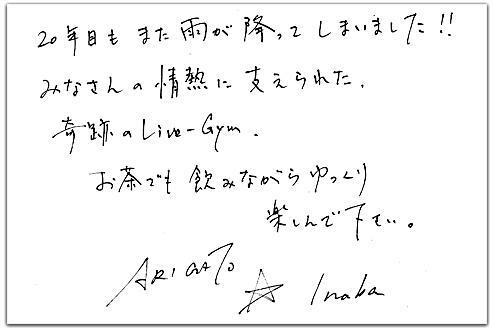 A miracle Live-Gym supported by your passions. Please, relax and have fun while you watch it over a cup of tea. Congratulations again to B’z on twenty years of success as the #1 rock band in the world. Here’s to another twenty! Hihi cute messages from Tak and Koshi! Great job and thanks for translation!